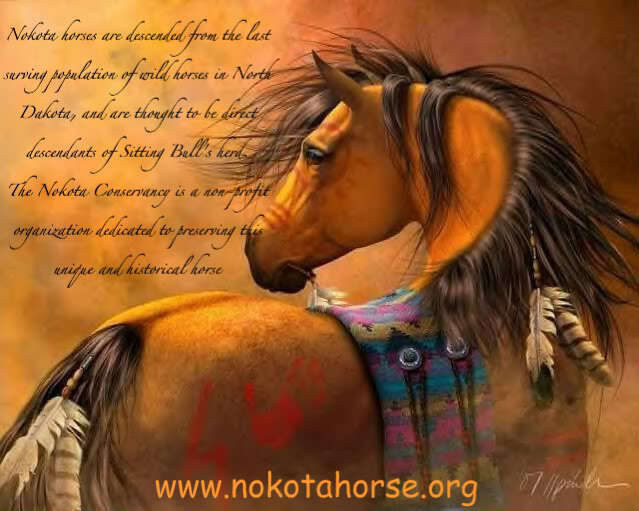 Preservation of the Nokota horse, the Native Horse of the Northern Plains. The last of the Northern Plains horse in North Dakota. A very rare and unique breed of horse, having survived in the most rugged terrain in the harshest climate in the United States for well over 100 years, they continue to struggle for their own existence. Nokota horses are descended from the last surviving population of wild horses in North Dakota. For at least a century, the horses inhabited the rugged Little Missouri badlands, located in the southwestern corner of the state. When Theodore Roosevelt National Park was created in the 1950s, some of the wild bands were fenced in, an accident that proved to have far-reaching consequences. While the raising of federal fences provided the horses with a measure of protection, the National Park Service (NPS) does not allow wild or feral equines, and is exempt from related protective legislation. Consequently, the park spent decades attempting to remove all of the horses. During the 1980s, Frank and Leo Kuntz began purchasing horses after N.P.S. round-ups, named them “Nokotas,” and started to create a breed registry. Today’s Nokotas are descended from generations of wild horses that lived in the rugged Little Missouri badlands in western North Dakota. Early Euroamerican travelers such as the artist George Catlin wrote about the presence of wild horses in North Dakota during the 1830s. Native people occasionally chased and caught wild horses, but generally acquired their horses through trade and by raiding enemy camps. During the early 19th century, North Dakota was a crossroads of international commerce and colonialism. The Mandan, Hidatsa and Arikara villages along the Missouri River were centers in a vast intertribal exchange network that linked communities across the continent. French and English fur traders based in Canada joined this system in the late 18th century, and were displaced by American traders during the 1830s. Trade goods from distant parts of North America and from unseen parts of the world flowed in and out of these riverine villages, and horses were among the most important commodities. Most of the earliest horses in the Dakotas originated in the Spanish southwest and were traded north by Indian “middlemen.” Native groups with direct ties to the southwest, such as the Shoshone, Pawnee, and Arikara, were the first to acquire large numbers of Spanish horses and mules. By raiding, trading, and breeding, other northern Plains peoples such as the Crow and Sioux built up far larger numbers of horses as well as political and military power. When Canadian (English and French) and American traders established posts in the area, they furnished new markets and additional animals. By the middle of the nineteenth century, some horses must have come into North Dakota from Canada, where the French developed the “Canadian horse” from stock imported from Normandy and Brittany. The French horses descended from both European “cold” bloods and “hot” Oriental strains including Andalusians. Like Spanish mustangs, Canadian horses developed a reputation for durability and stamina. Initially bred for two general types, the Breton small and relatively refined, the Norman horse larger and heavier, they coalesced into tough all-around horses that could be used for both riding and pulling, and many worked as loggers. While they have been all but forgotten today, Canadian horses were widely admired as late as the Civil War, and they probably influenced generations of Indian, ranch, and farming horses in the Dakotas, as well as their feral brethren. The BLM is a “man made disaster for USA Mustangs and Burros…A.W. I,m SURE, fences to secure or re-fixing fences, can help the econmy,,LOTS of people, looking for a job, or second job, with a pay. Much less expenses, then BLM-Round-ups, that cost a fortune…come on..
My husband and I have “Nokotas” and also horses that were taken out of Theodore Roosvelt National Park in western North Dakota. The horses from TRNP now have a registry and a group working very hard on their behalf. The registry is called “North Dakota Badlands Horse Registry”. We have found both horses to be the same, tough, smart and did I say tough. Their feet and legs are made for traveling over harsh conditins with no problems. Once you have earned they trust they are your best friend and loyal.